France has more than a bevy of beautiful towns, cities and hamlets, and with the invitation of author M.L. Longworth to visit her in Aix-en-Provence (“Aix” is pronounced as you would the letter “x”) and take a tour about the city which has surpassed the Côte d’Azur as the second most sought after place to live other than Paris (and the real estate prices reflect this change), I said yes, absolutely. As the talent behind the Provençal mystery series which is situated in Aix, she took me through the streets to see not only the sites many people are curious about, but also the sites which are mentioned in her novels – (discover below the buildings in which Marine as well as Antonin are inspired to be living, as well a the fountain which was the secondary star in her second novel – the Four Dolphins and the cafe Marine frequents often in the first book as well as subsequent capers). 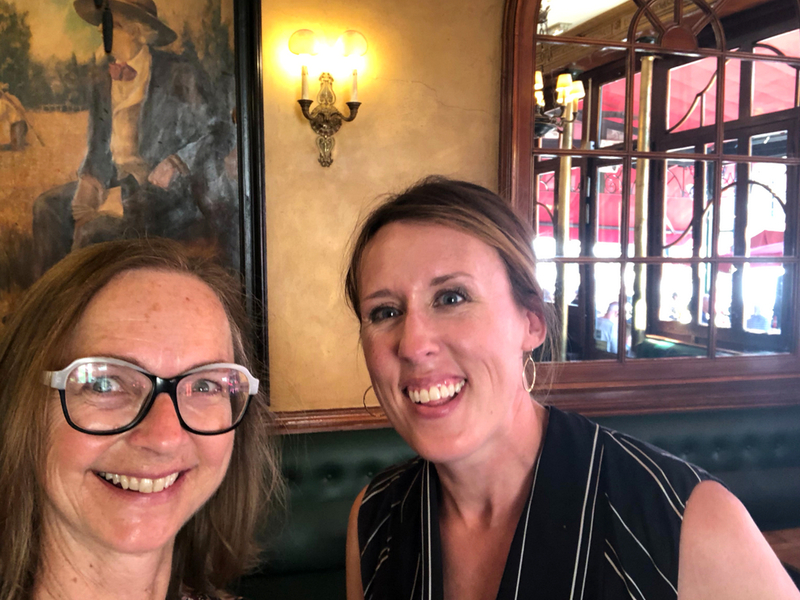 Be sure to check out my Instagram Stories Highlight France Trip, part 6 to see my entire day with Mary Lou. It was a wonderfully warm summer day in early July, and a soft breeze kept the temperature ideal. 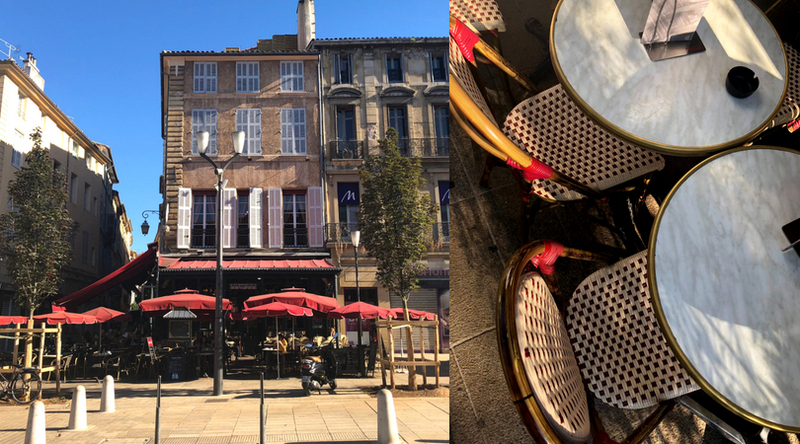 Beginning with a croissant and drink of something warm to begin the day at Le Grillon (pictures below) enjoyed outside on the terrasse, the world of Aix passed by, and I quickly came to understand why people love living and visiting this southern city in Provence. 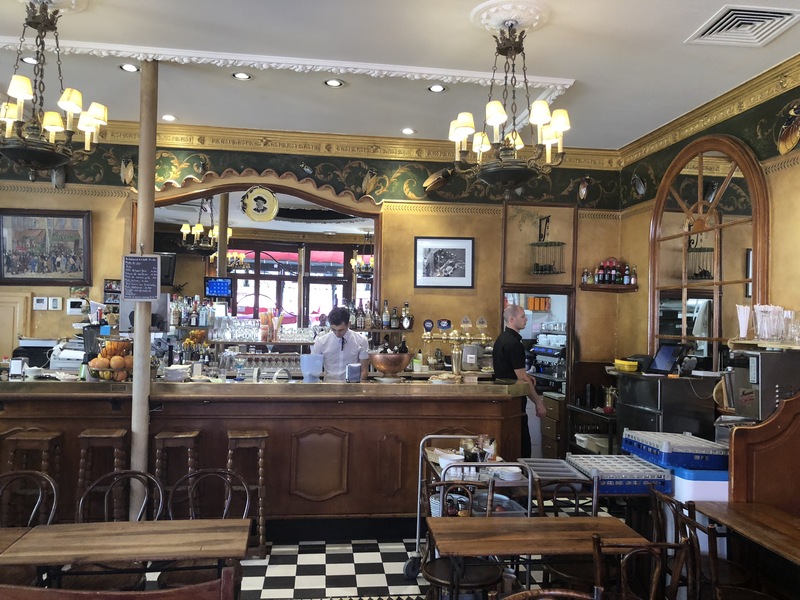 Mary Lou has joined me for a Q & A about her life in Aix-en-Provence over the past twenty years (see below), what she loves and is most fascinated with regarding the town and its history as well as what about the town inspires her writings. Have a look below, and enjoy getting to know M.L. 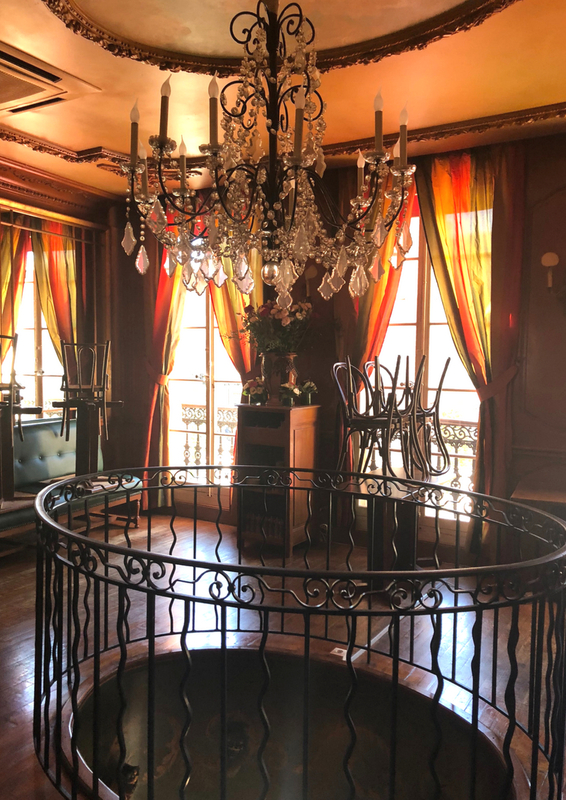 even more since she last joined me on The Simple Sophisticate podcast here (episode #203) to talk about her most recent mystery, The Secrets of the Bastide Blanche. 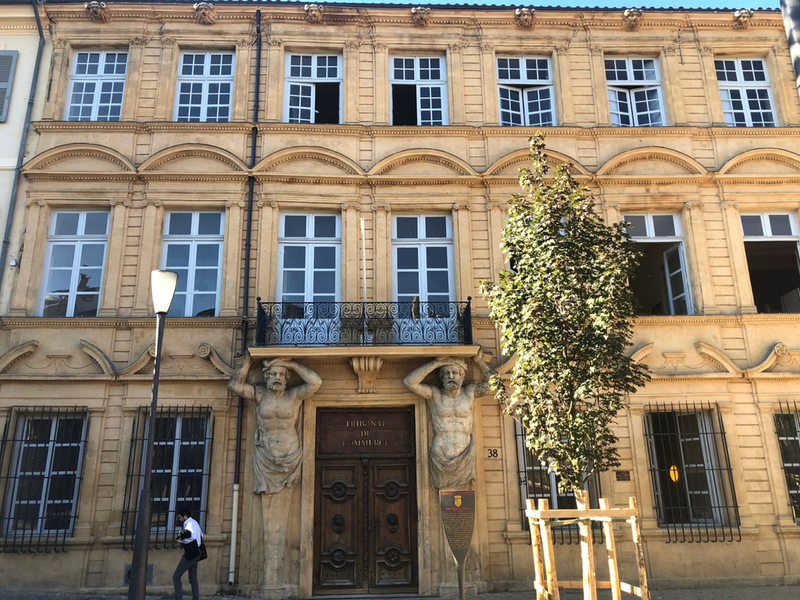 What are 2 or 3 historical ahas you learned since living in and near Aix that still impress you to this day? 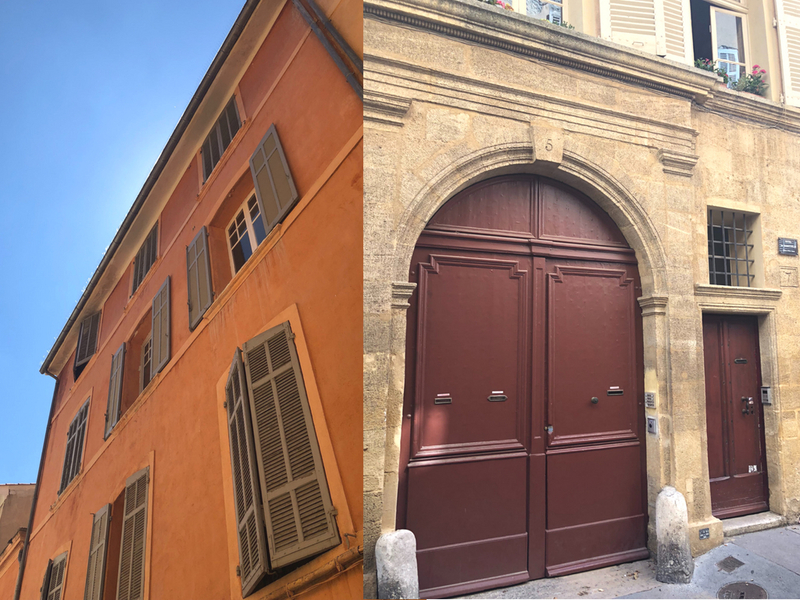 One of my biggest thrills, even to this day, is the fact that underneath the modern, Renaissance, and medieval buildings of Aix lies a whole other city and even older civilization: that of ancient Rome. Aix is a thermal spring town, prized by the Romans, and ruins of their houses and streets are constantly being dug up. It thrills me that Roman parents walked their children to school as we do; and bought beautiful spring time strawberries in the open air market, chatting with their preferred vendor, as we do today. If I could have chosen any painter to have come from Aix, it would have been Paul Cézanne (close runners up: Picasso, or van Gogh). 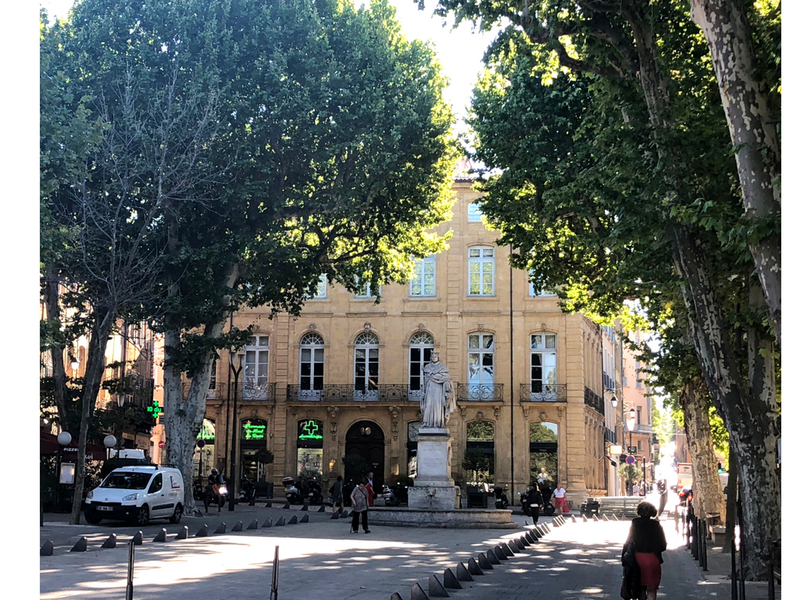 As luck would have it, Cézanne was born in Aix in 1839 and visitors can follow in his footsteps around the city guided by bronze Cs imbedded into our sidewalks. His beloved mountain, Saint-Victoire, can be seen from many spots in the city, another constant reminder of the great daring painter, whom Picasso called ‘the father of us all.’ (a great view of the mountain from downtown is atop the GTP—the Grand Theatre de Provence). 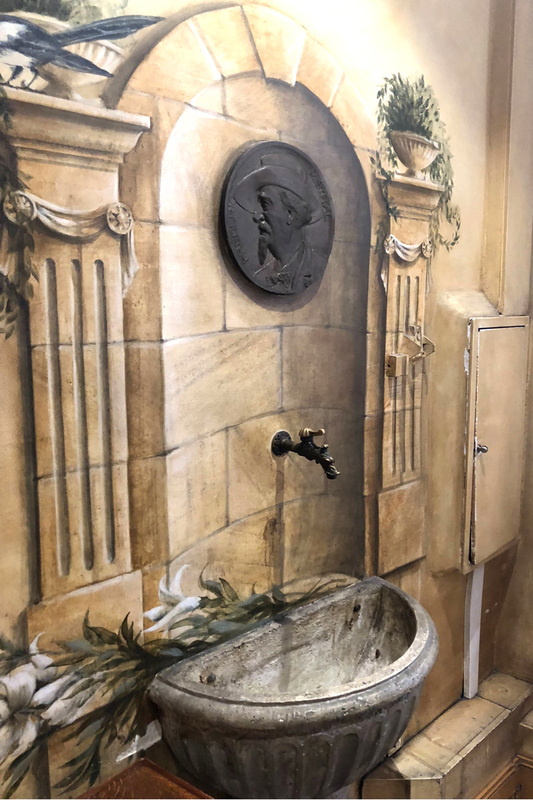 His studio, located on a hill in a residential street, was left and remains as he left it in 1906, with his cloak hanging in a corner, his favorite vases and jugs sitting on wobbly wooden tables. I once visited the studio and overheard a German tourist complain, “Is this all? Why haven’t they made a proper museum?” And I’m so glad they didn’t. What was your first impression of Aix? Stress-free. We first visited Aix on holiday, in November 1996. We were staying at the Hotel Cardinal (no e), on rue Cardinale (with an e), in the Mazarin neighborhood. At breakfast in the hotel, I watched out the window children and their parents walking to school. They were laughing, and chatting. I thought ‘oh, how happy everyone looks. And no cars.’ These kinds of images one often gets on vacation, I realize, but as it turns out by February of the following year we were living in Aix and walking to school really was like that. There was a noted absence of cars, and people smiled and said hello to each other. 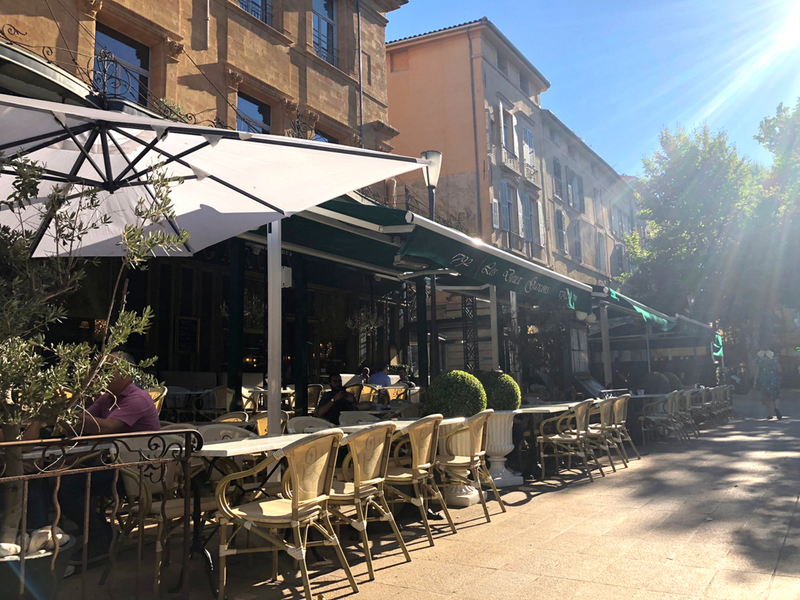 Of course that was twenty-one years ago, but Aix, and Provence, remains that way and Aix is still a friendly small town. Our daughter, who lives and works in Paris, always comments on it when she comes back for the weekend. Having lived here for now more than 20 years, what has changed, what has stayed the same? Ha, I guess I partly answered that question above. And now for the down side: in the twenty plus years we have lived here, the city has made some unwise decisions (in my opinion!). At the bottom of the Cours Mirabeau, where there used to be an old bus station and Art Deco-era Casino, there now sits a shopping mall, with the same shops you now see the world over: H&M, Zara, Levis. Why didn’t they give the city a badly-needed park, with benches for the elderly, and for high-school students who are constantly having to eat their lunch sitting on doorsteps? With a stunning garden that everyone can enjoy? 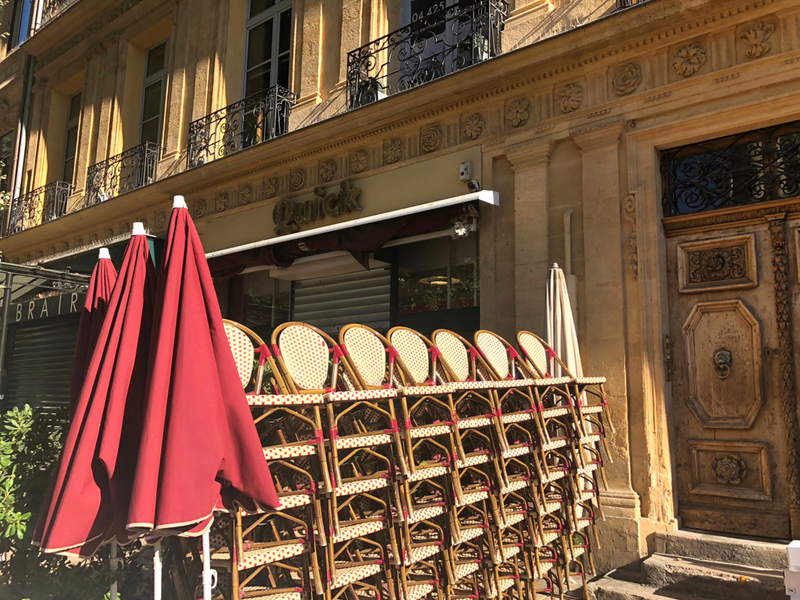 Many of the mom-and-pop shops that were downtown have also disappeared, due to globalization, and the soaring costs of real estate in Aix. 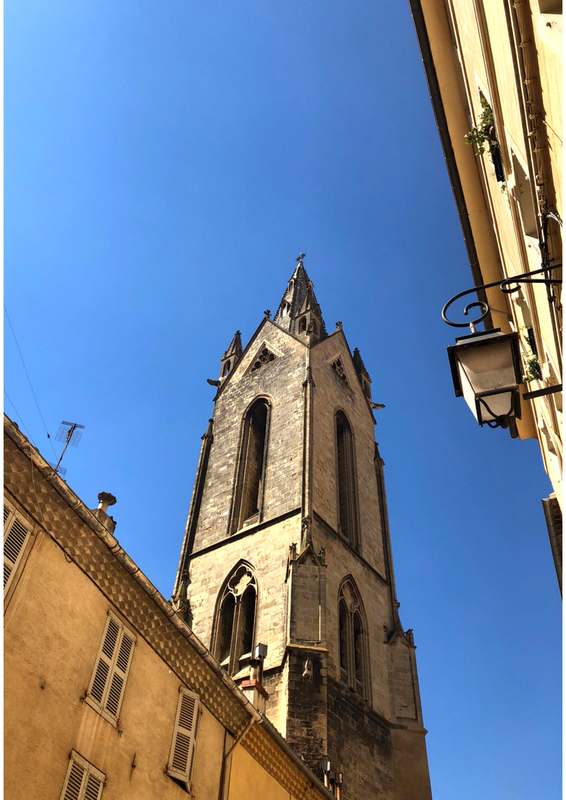 If someone is visiting Aix for the first time, what do you recommend they see and do? 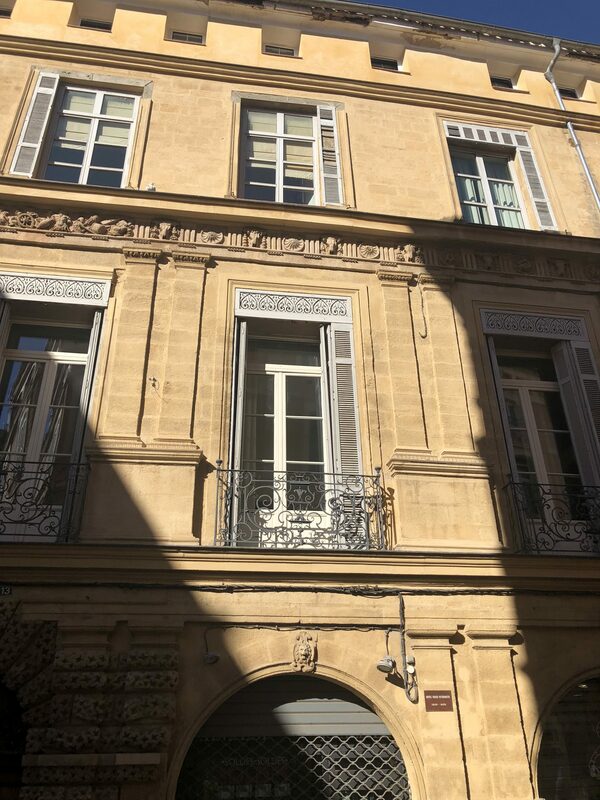 Just walk around the downtown, beginning on the Cours, then through the medieval quarter with its twisty narrow streets, then on the south side of the Cours in the ‘modern’ Mazarin (17thand 18thcentury townhomes with parallel streets). Have a long leisurely coffee in a café and watch people. 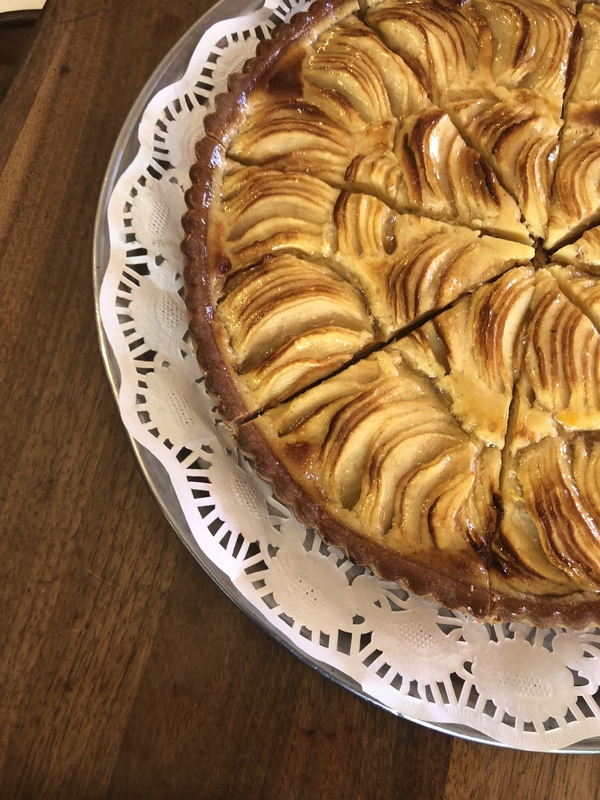 Buy pastries at Béchard on the Cours (Michaud in my books). Visit the cathedral and its wonderful cloister. Buy picnic provisions at the market and try chatting with people, even if you only know a few words of French. 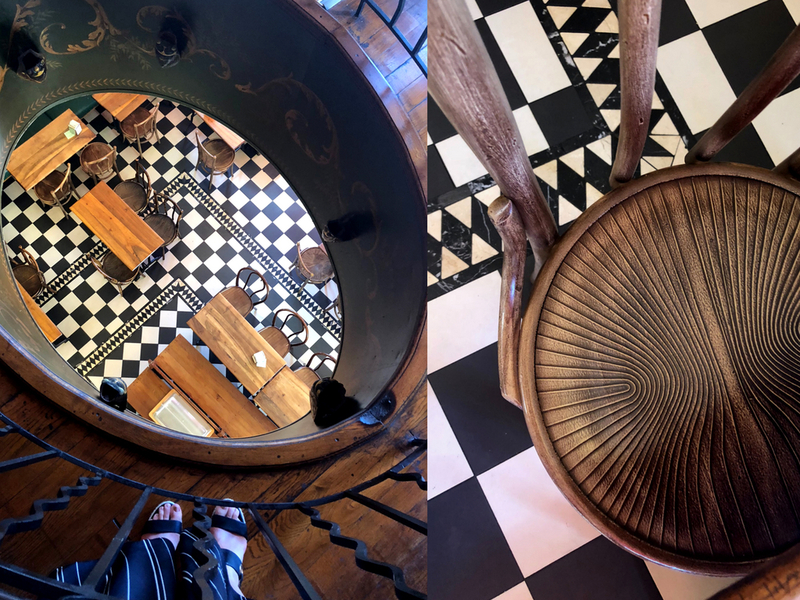 I’d also recommend, if possible, driving around the countryside to admire the vineyards and olive groves, stopping in at wineries to taste and buy a few bottles of the local wines that are very good and not too expensive. It’s also a great chance to talk to a local producer, as winemakers tend to be gregarious (the world over! Haha) and know some basic English. Compared to Paris, what is similar and was is different? Aix is a very small city, only 150,000 habitants, so it obviously lacks the crowds, and grand museums, that Paris has. It also doesn’t have Paris’s wonderful choice of restaurants. But like Paris it is very cosmopolitan and cultured. And it’s physically beautiful, especially at night, just like Paris. Your mysteries are primarily set in Aix. You shared with me how the lawyers and judges regularly come to the café you enjoy frequenting which inspired aspects of your stories. What are some parts of Aix living and observations that have sparked a story? I get inspired by the beauty of the buildings and streets, and when I’m out walking will imagine a scenario that takes place in one of these golden-stone buildings. Aix is small, so you’ll often run into people you know, so that inspired me to write the first book, knowing that Verlaque and Bonnet wouldn’t be able to keep secrets from their Aixois neighbors, but would also be aided by the fact that friends and neighbors would be able to help them out with their cases. 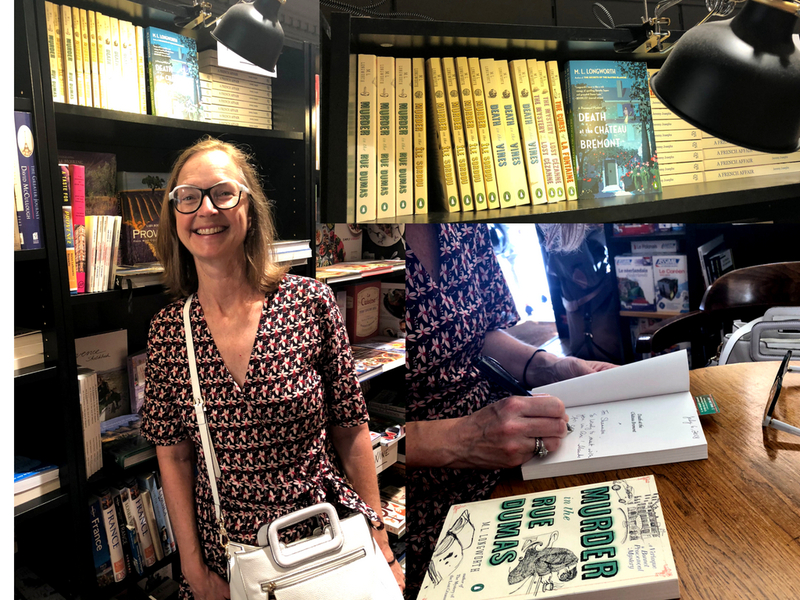 The fact that everyone here seems to know each other I find really rewarding as a mystery writer; Aix becomes, in my head, like Miss Marple’s St Mary Mead. Could you talk a bit about the outdoor markets in Aix? When do they happen, what can a visitor expect? There are two main markets in Aix. The larger one is every Tuesday, Thursday, and Saturday, and is a mixture of fruit and vegetables, new clothing (not my thing), and small antiques and house wares (super fun). I find it too big, and get overwhelmed, especially with stalls selling polyester clothing that you have to get around in order to buy food. The other market is every day on the Place Richelme, and this one is my favorite. It is small and only sells food, and some wonderful honey and soaps, and fresh flowers. The market in the Place Richelme has vendors who grow their own produce, and who will specialize in whatever is in season, like mountains of asparagus in April, or mushrooms in the fall. Aix is known as the city of fountains. What is the history behind this and what fountains are you most drawn to? 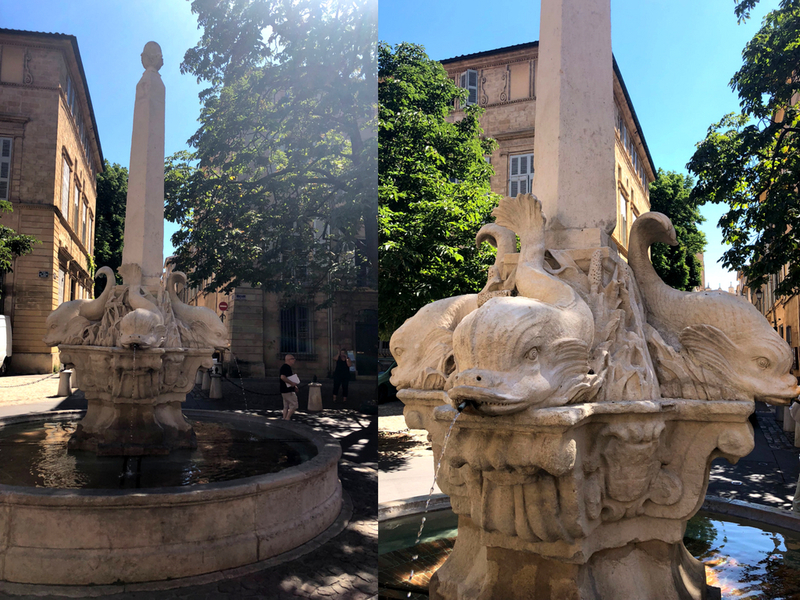 Aix doesn’t have a body of water, or even a river, but it is a Roman spa town, so we had water beneath the city and dozens of fountains were built to supply Aixois with fresh drinking water and to give the residents that much-needed water fix. They are beautiful to look at, and everyone likes the sound of running water. My favorite fountains are ones that have been placed in quaint, usually small, squares: The Place d’Albertas, the Place des Trois Ormeaux, and the Place des Quatre Dauphins. 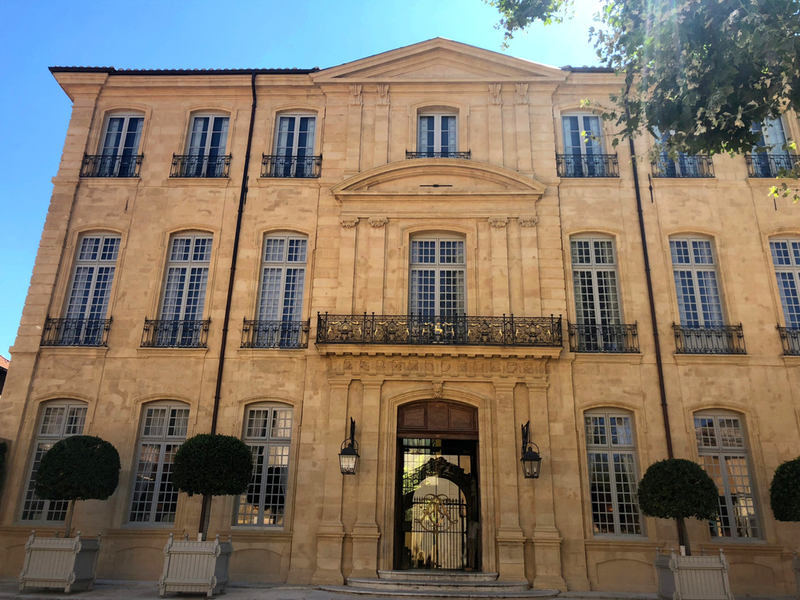 What sets Aix apart from other major cities in France? 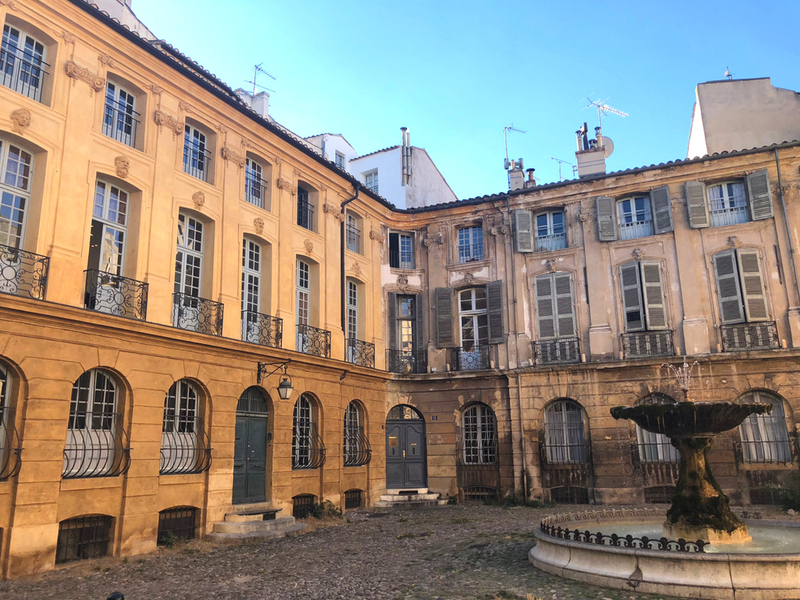 Aix is small, but it’s true that because of its international fame we tend to compare it to French cities that are much larger, like Toulouse for example. 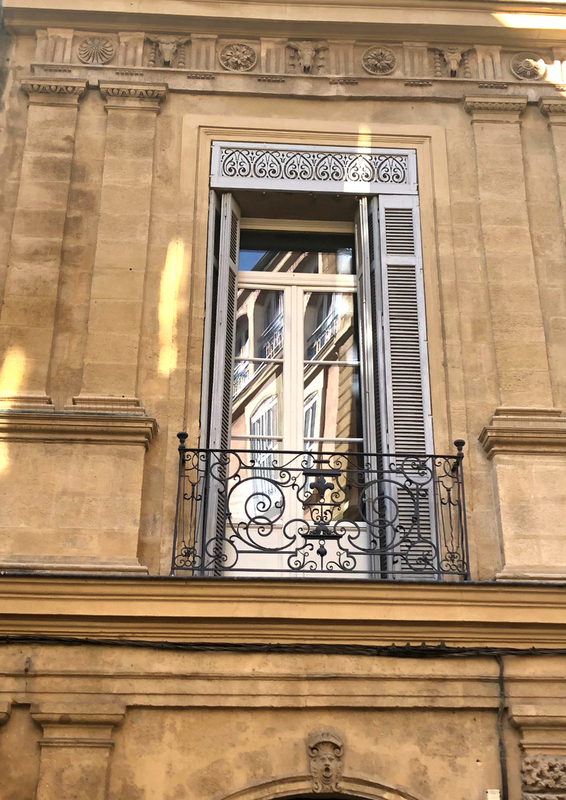 We’ve travelled a lot around France, and I can honesty say that Aix isn’t lovelier, or prettier, than Toulouse, or Nantes, or Arles, or Bordeaux. They are all different, and each region of France has its own distinct charm. 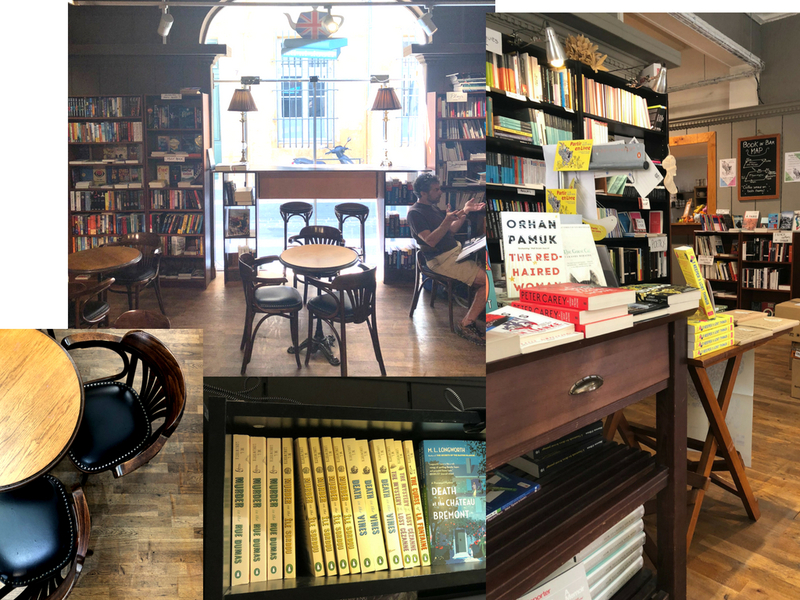 I write about Aix because I live here and know it so well. Enjoy more images from my tour in Aix-en-Provence below. I was an exchange student in Aix en Provence many years ago. So fun to see pictures of it again. Thanks Shannon for this lovely post! I have never been to Aix but I am a fan of Ms. Longworth’s books. I just finished “The Mystery of the Lost Cezanne” and I was so happy to see some of the landmarks, cafes, etc. mentioned in her books. I truly loved your photos and now I can enjoy and appreciate her books even more. 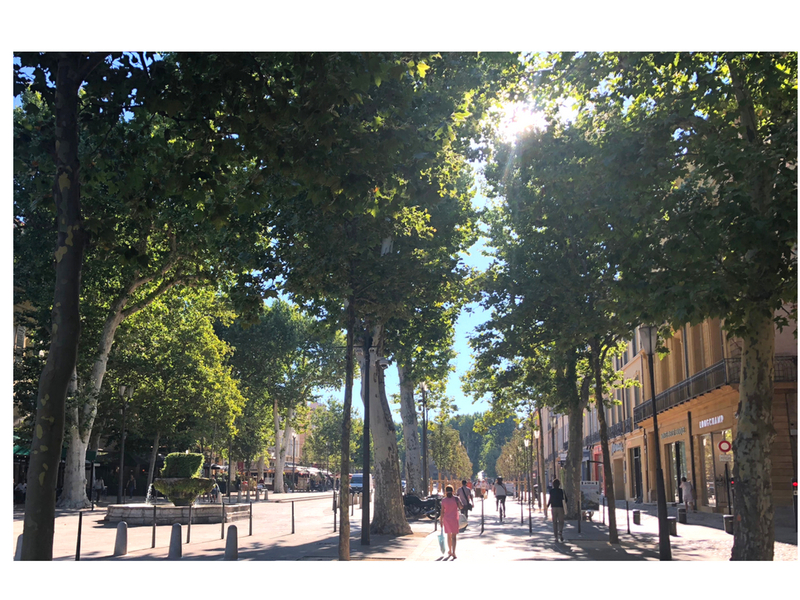 Thanks for letting us see Aix through your eyes. I hope to visit Aix one day.